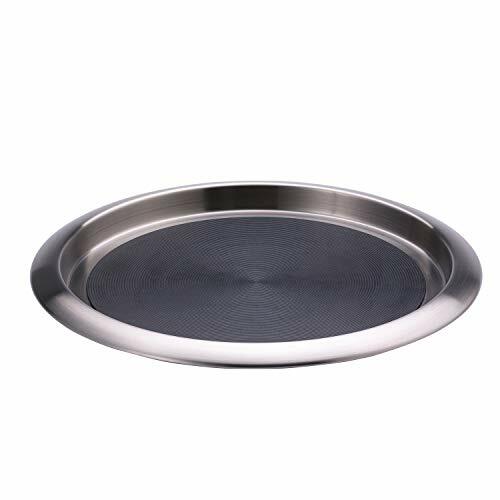 Service Ideas TR119SR Tray, 18/8 Stainless Steel, Stackable, 11" x 9"
Service Ideas TR1412RI Tray, 18/8 Stainless Steel, Removable Insert, 14" x 12"
Southern Champion Tray's 0711 White paperboard hot dog food tray is a rectangular, single-use tray for a foot long hot dog, or can be separated at the perforation in the center to use for two regular hot dogs. Each case has 500 trays. 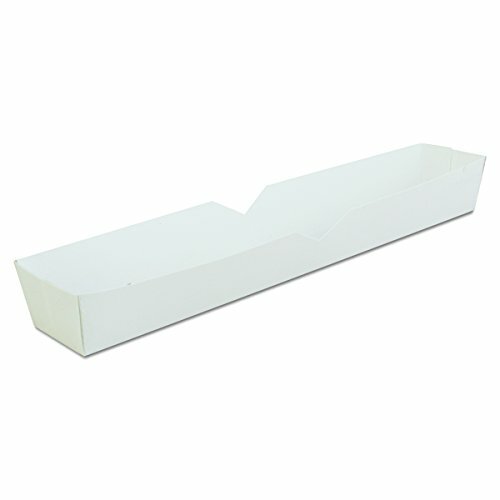 Southern Champion Tray manufactures paperboard packaging products. The company, founded in 1927, is headquartered in Chattanooga, TN. 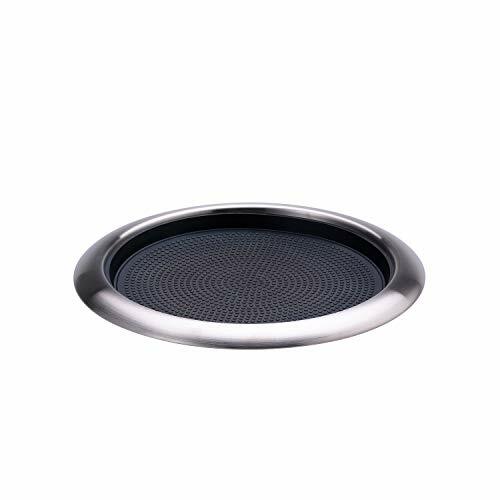 Our multipurpose stainless steel tray matches bathrooms and kitchen fixtures. 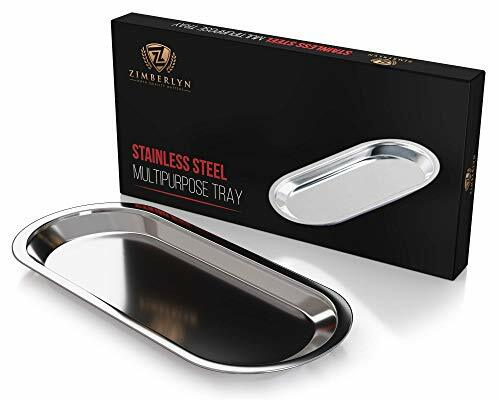 18/8 Stainless Steel Tray With Molded-In Silicon Rubber, Not Removeable. Dishwasher Safe, But Hand Wash Recommended For Longer Life. Mfg Date Code On Bottom Rubber: 2 Dial Yy Mm; Packout Date Code Yymmdd Ink Stamp On Bottom Tray. Product Markings: Service Ideas, Inc. Mpls Mn 1-800-328-4493 Tr119Sr, Www.Serviceideas.Com. Made In Taiwan. Retail Box: 12 X 12 X 1.5.Product Manufactured Before May 2012 Was Made With Tpr (Thermoplastic Rubber, A Plastic/Rubber Blend). 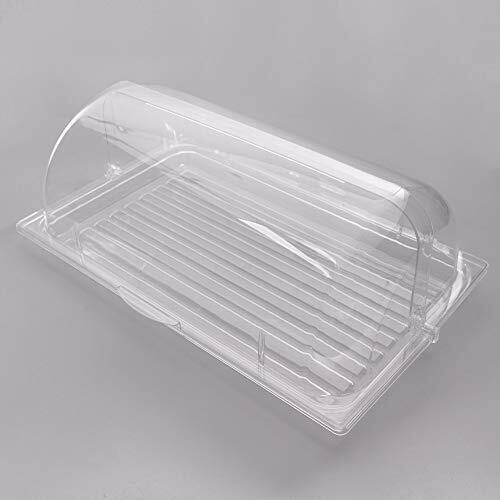 Tray, 18/8 S/S 11 X 9"
Party Essentials high quality heavy duty clear plastic tray with a perfect design for serving. 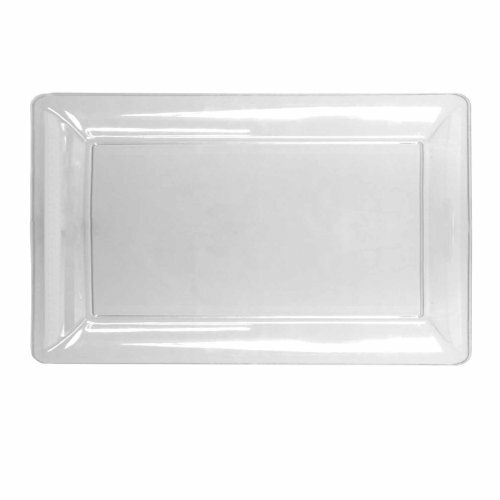 Rectangular shape great for appetizers, pastries, sandwiches, and hors d'oeuvres. Raised sides keep food on platter. Perfect for parties, food service, and everyday use. Disposable for easy clean-up. Measures 12-inch length by 18-inch width. 6 trays per case. Great item for concession stands! Everyone loves a great tasting snack. 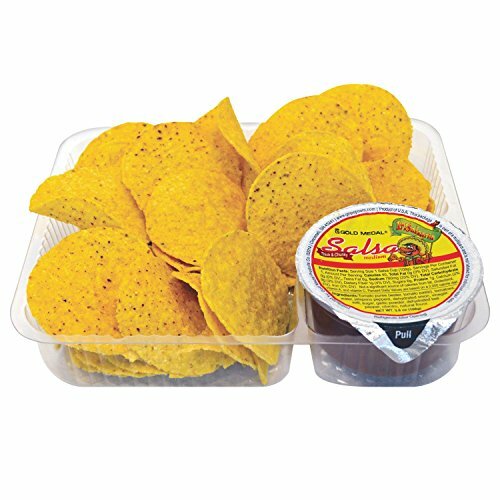 These two-compartment trays make the perfect container for delicious nachos. 18/8 Stainless Steel, .7Mm Thickness, Stackable Tray With Removable Silicone Rubber Insert. 14" X 12" X.75" This Surface Will Prevent Slipping. Dishwasher Safe, But Hand Wash Recommended For Longer Life.Product Manufactured Before May 2012: Insert Was Made Of Eva (Ethylene Vinyl Acetate). Approved Switch To Rubber Nbr, Po# 10053, Product Code 9/14. Brand: SOLUT! | Manufacturer: SOLUT! 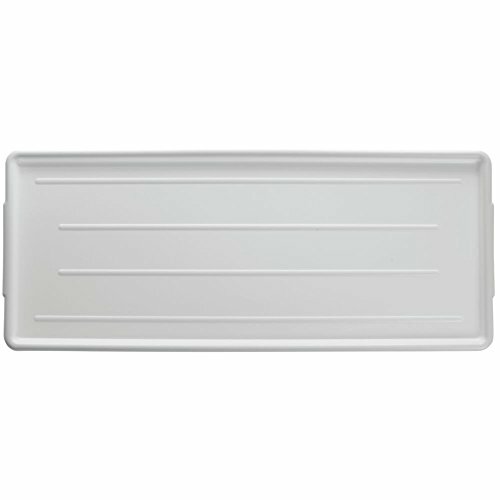 Market Display Tray, 12-7/16" x 30" x 3/4", fiberglass, white, NSF. The product is manufactured by United States, The brand name of the product is Cambro. 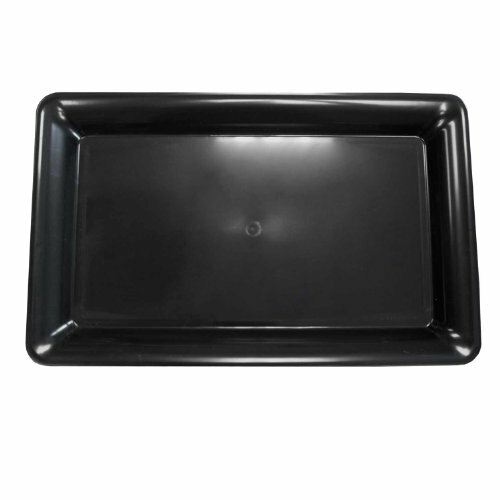 Party Essentials high quality heavy duty black plastic tray with a perfect design for serving. Square shape great for appetizers, pastries, sandwiches, and hors d'oeuvres. Raised sides keep food on platter. Perfect for parties, food service, and everyday use. Disposable for easy clean-up. Measures 16-inch length by 16-inch width. 6 trays per case. 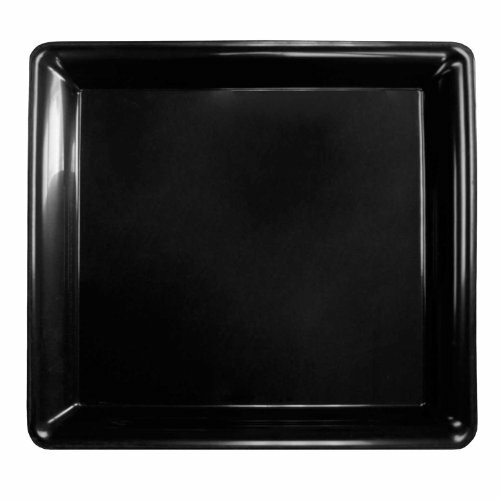 Party Essentials high quality heavy duty black plastic tray with a perfect design for serving. 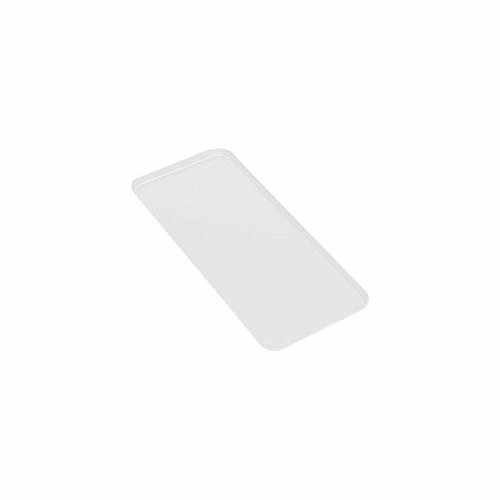 Rectangular shape great for appetizers, pastries, sandwiches, and hors d'oeuvres. Raised sides keep food on platter. Perfect for parties, food service, and everyday use. Disposable for easy clean-up. Measures 12-inch length by 18-inch width. 6 trays per case. 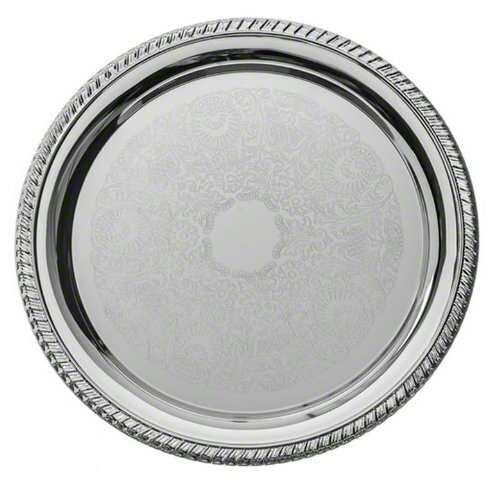 Serve in style with American Metalcraft s Affordable Elegance Serving Tray! 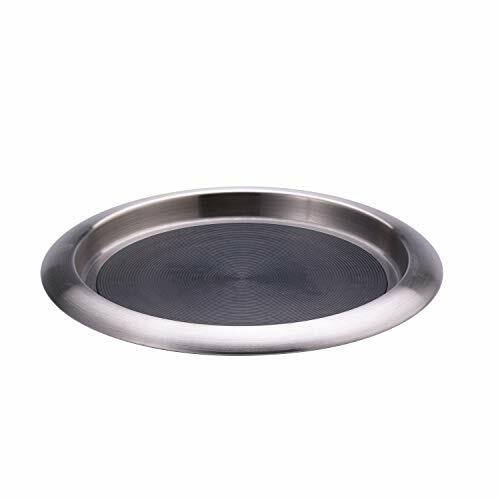 This embossed chrome-plated tray adds a professional, elegant touch and is perfect for serving food or using as a platter. A must-have for any fine dining experience, this tray is also great for serving drinks at home or breakfast in bed. 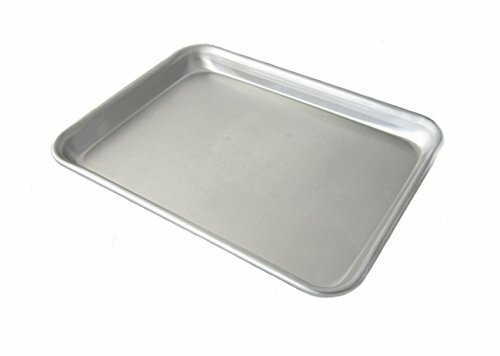 Easy to clean, this tray is hand wash only and should be polished dry with a soft cloth to maintain its shine. 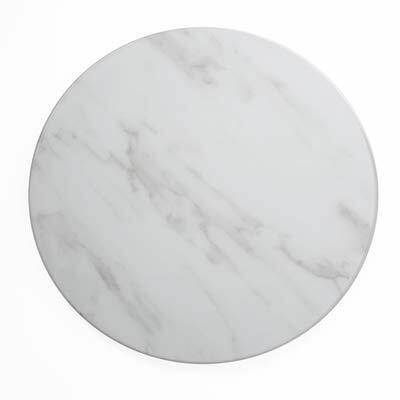 Each order contains one round serving tray measuring 10 Dia. x .5 H. With 70 years of service, American Metalcraft is a leader in the foodservice industry for trend-focused and unique products. Brand: American Metalcraft | Manufacturer: AMERICAN METALCRAFT, INC. This sample dome set features a turn and serve top. Simply turn the dome for access then to close. Each sample dome set is complete with ice bowl and flat tray for food items. 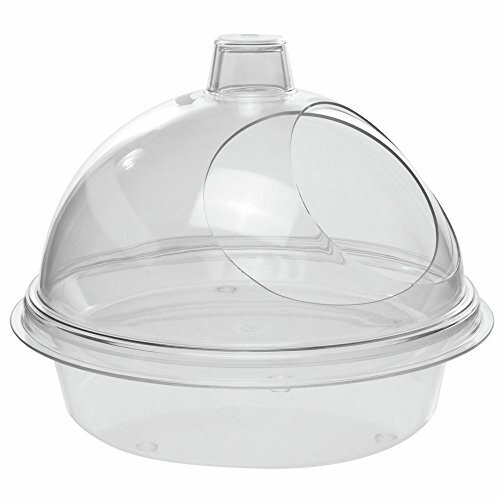 The turn and serve dome then covers the food to protect from contamination. This sample dome set is a great way to sample products in your deli. 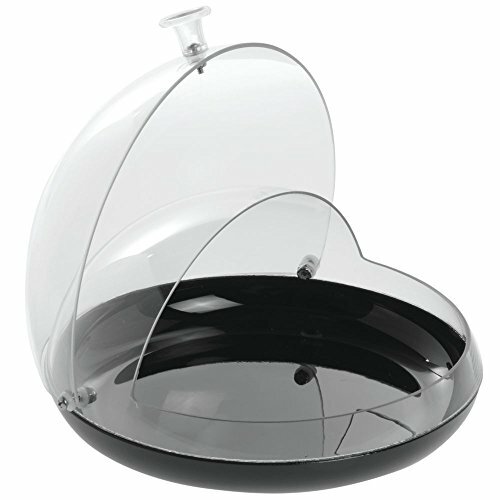 This sample dome has a transparent easy opening top for great product viewing and access. Each container has a black base that provides contrast to items showcased. The sample dome is BPA free for safe food use and storage. 8"Dia container will hold all those finger foods to tempt your patrons into purchasing. Purchasing this sample dome is a great addition to any supermarket. 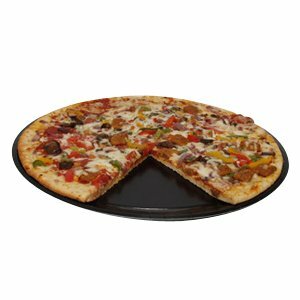 Cambro Cam-trays are a favorite for pizza and beverage service. The Cam-tray is stain, odor and scratch resistant trays are backed by a 5 year prorated warranty against any breakage, cracking or warping. Designed to outlast just about everything and everyone. All decorations and patterns are molded under tough surface mat and resin to last. Molded-in Dri-Stak separators ensure even air flow between trays for quick drying. Standard Features: Cambro Round Cam-trays Diameter: 10" Color: Black Material: Lightweight High-Impact Fiberglass Molded-In Dri-Stak Separators Round Shape Reinforced Aluminum Edges Stain, Odor and Scratch Resistant NSF Listed Not For Use In Heated Carts Personalization Available Non-Returnable Item Color Permanently Molded into Tray One Case Order Minimum Dishwasher Safe Five Year Prorated Warranty Against Breakage Model number: 1000110 613604. Looking for a display option that provides an eye-catching appearance without sacrificing durability? Give all of your delectable pastries, deli samples, and baked goods a tantalizing display with the polycarbonate clear market tray with clear roll top cover. Whether displaying muffins at your bakery, or holding bite-sized samples at your deli, this tray and cover are sure to meet all of your needs! Providing the upscale look and feel of glass, the cover's clear polycarbonate construction allows for exceptional product visibility. Perfect for merchandising at your bakery, cafe, buffet, catering service, or deli, this tray and clear roll top display cover beautifully showcases all of your signature items. 18/8 Stainless Steel, .7Mm Thickness, Stackable Tray With Molded-In Solid Silcone Rubber Surface To Prevent Slipping. 14" X 11.5" X.75" Dishwasher Safe, But Hand Wash Recommended For Longer Life. Product Manufactured Before May 2012: Solid Rubber Surface Was Made With Tpr (Thermoplastic Rubber,A Plastic/Rubber Blend).Product Manufactured Starting Late 2014- Po Mn.10073 Switch To Rubber Nbr. This plastic display tray comes in many different dimensions, making them perfect for anyone. The food displays are extremely durable as they are molded from polystyrene. Each plastic display tray has a ribbed bottom, which provides increased strength. The food displays are perfect for showing the great texture of any kind of meats. 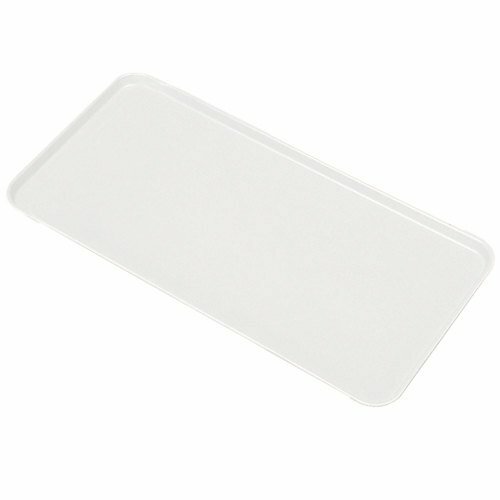 These plastic display trays have a 3/4" diameter, preventing any meats from sliding off the surface.